AS the son of a supermodel and a movie superstar, it was always going to be in the blood. So no one was really surprised when Flynn Bloom turned out to be a natural when he took his first turn in front of the lens. Miranda Kerr’s three-year-old son with former husband, actor Orlando Bloom, happily posed with his famous mum during a secret shoot for Vogue Australia in Sydney last month. Kerr appears with Flynn, who is standing on two crates to plant a kiss on his mum’s cheek. Vogue editor Edwina McCann said the youngster, whose face is partially concealed in the photos, was an eager subject. “He loved it. Loved being involved and working with mummy, and the crew fell in love with him. He’s such a confident little kid and they have a playful relationship,” she said. The idea for Flynn to appear was Kerr’s, McCann said. “She had to approve the image and had to check with Orlando in advance,” McCann said. Miranda updated her official website, where you can find links to her Facebook, Twitter, Instagram, Pinterest. Miranda attended the 2013 Met Gala held at the Metropolitan Museum of Art on Monday (May 6) in New York City. She is wearing a Michael Kors dress, Tabitha Simmons shoes, Cartier jewels, and carrying a Christian Louboutin purse. Miranda Kerr has denied talk that she was dropped from high-profile clients Victoria's Secret and David Jones, saying nothing could be further from the truth. Speaking exclusively to Fairfax Media before her arrival in Sydney on Sunday to launch the new Qantas uniforms, Kerr said moving from the companies was a deliberate change in direction she initiated. Kerr said she was ''surprised'' to hear reports that she and the US lingerie brand were going their separate ways due to her ''difficult reputation''. ''I'm sure anyone that has worked with me would agree that it's not true,'' she said. Making the move from catwalk supermodel to entrepreneur has been her goal since the birth of her son Flynn, now 2, and a change in management earlier this year from Chic to IMG was to help drive this. She wanted the change to be in place by the time she was 30: her birthday is on Saturday. ''This is a natural evolution,'' she said from her Los Angeles base, which she will pack up in the coming weeks before a move to New York where husband Orlando Bloom will perform in Romeo and Juliet on Broadway. ''The thing is, I've been modelling since I was 13,'' Kerr said. ''I'm now entering a new phase in my life. I have felt this coming since my son was born and, after I became a mother, I realised I needed to prioritise my time. Later this year, she plans to release her second book, Empower Yourself, a follow-up to her bestseller, Treasure Yourself, and focus on her skin care range, KORA Organics, which is stocked in more than 400 stores nationally. She also has distribution plans with the beauty arm of mega site Net-a-Porter for an e-retail site, which she hopes to launch by the end of May. She is also passionate about campaigns with Qantas, Clear Hair & Scalp Therapy, Samantha Thavasa and Reebok, is the global face of Mango and is ambassador for Kids Helpline. Being locked into contracts for half of the year, as she was with David Jones and Victoria's Secret, was just not possible in her new life. Kerr stresses she still has a relationship with Victoria's Secret and is ''grateful to'' the lingerie label for launching her career in the US. She will continue to work for them (Ed Razek, president of the label, released a statement saying she ''will always be an Angel to me'' and ''we have no plans to stop working with her''), just not under a strict contract. Kerr has even agreed to their invitation to walk in the show this year. It is this reason that also meant the end to her five-year alliance with David Jones, a brand she came to embody. Emphasising how much she loves working with Aussie brands, Kerr says while she loved and was grateful for the association with DJs, she instigated talks with them last year to re-prioritise her family and other business opportunities. ''I couldn't commit to them in full and their requirements with everything they wanted from me, but our association still lives - KORA is stocked [nationally] in DJs and so is Mango,'' she said. Even though she couldn't bring Flynn and Bloom for her Qantas visit (''it's not really worthwhile for a few days, as the jet lag is hard for them''), she always loves coming home. But she has had to pull out of a planned birthday celebration in her home town (''I was going to but I looked at the schedule and it wasn't [fair], we wouldn't have had the time I wanted''). Instead, Bloom is organising a private party at their home. ''He knows I like to dance and he knows I like to sing and I have the most fun when I'm singing and dancing - so I think there might be a little karaoke going on,'' she said. Welcome to bloom_kerr. 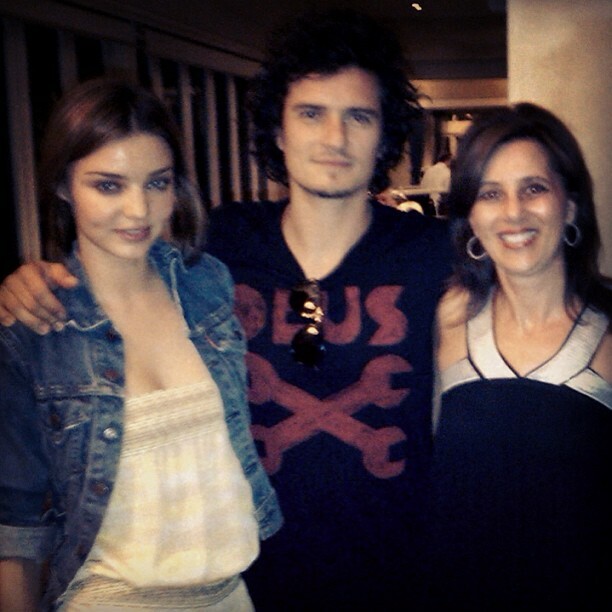 This is a community dedicated to celebrity couple, Orlando Bloom & Miranda Kerr. Here you'll find the latest pictures, news, media and so much more! Be sure to follow us on twitter for the most instant updates! CSS by snubbly, customization and header by divinesecret.